Hello there and many thanks for visiting my blog. 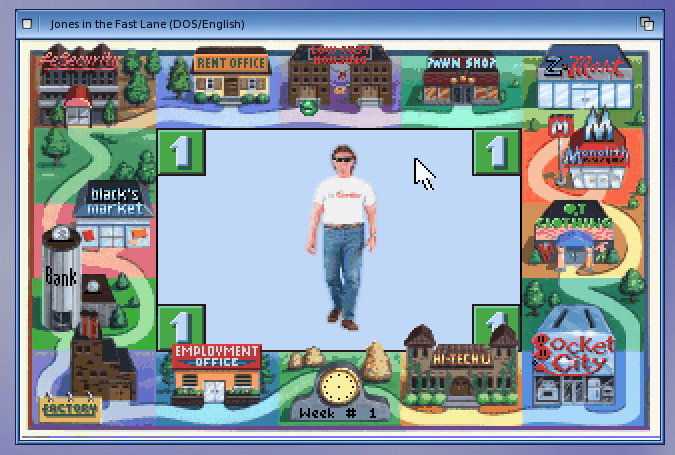 The game is called Jones in the Fast Lane and was developed by Sierra, a company famous for games like the Kings Quest, Larry and Police Quest. It came out in 1990 for PC’s with MS-DOS. There is no native version for AmigaOS 4, but we can easily run it through the wonderful tool ScummVM. If you want to know more about ScummVM and how to get it working on Amiga, please check out my post about The Flight of the Amazon Queen. Ok, let’s get down to business with this classic. Once it has finished downloading, unpack it to a directory of your choice (right-click icon, choose “extract to”), preferably your ScummVM one. Now you need to add the game to ScummVM. To add, click on “Add Game” and select the directory where it resides and follow the prompts. Should be quite straight-forward. Now we are ready to join Jones and enter a world of both business and leisure. You can play the game in a window on your Workbench desktop or you can play full screen. I tried full screen first, but switched to window mode later. Taste differs. Jones in the Fast Lane is a life simulator. In this game the goal is to climb the ladder in society by working, getting education (to get better paid jobs) or to just have luck and win the lottery. I’ve taken a bunch of screenshots while playing, so let’s go! Let’s select the 1-player mode. Here is the character selection screen. I went for the guy with sunglasses. Goals? Let’s keep it average for this round. Do I want to challenge Jones? Oh yes! Here you can see the world of Jones. There’s a bank, an employment office, a school and so forth. Went to check out the deals on burgers at Monolith Burgers. Prices are for a whole weeks worth of food. It’s time to get a job. Will I enter the world of finance and big money? Perhaps become a fashionista or en electrician at Socket City? Landed a job at Monolith Burgers as a cook! Nice! A tough week. Time to relax at home. Not much left of the week. It’s Jones turn and it turns out he’s pretty good! This came up because I forgot to eat at Monolith Burgers or to shop groceries (which is a better alternative I guess). You’ll get a time penalty, which means less time for work and education. Decided to try getting some education to land a better job. Once you’ve finished a class, you’ll get more options. Got a new job at the Z-Mart, but my clothes weren’t good enough. Guess I’ll have to visit Q.T Clothing! Oh man, I can’t afford clothes for the new job! This means that I’ve got to get another job. A dilemma! As you can see from the screenshots and the descriptions, the game is kind of like real life. It’s very fun, but more challenging than it looks. You’ve got only so much time you can spend on different tasks, so you must do the right priorities. I found myself broke in the end with no solution in sight, while Jones was rising to become the top banana in the local community. It’s also worth mentioning that you can play this game with other people. It’s turn-based and works pretty well. This is a fun game, very fun indeed. There is a lot to discover, there are strategies to learn, there is humour and pretty graphics to boot. I really like it and I love the fact that it is now playable on AmigaOS 4 through ScummVM. Back in the 90’s I was so envious at those who had PC’s, since they could play this game at home. Now us Amiga owners can too! I highly recommend giving Jones a go. A super game! Thanks for reading and hope this sparked your interest in trying this game on AmigaOS 4. Nice review, but please – don’t plant any fake news here. Who has given you the idea that downloading copies of Jones in the fast lane is “perfectly legal”? As much as I would want it to be, you better present some hard evidence before you tell us something that isn’t true. Sierra has never, as far as I know, placed Jones in the fast lane under any kind of public domain license. Please prove me wrong and I would be more than happy to give you a sincere apology for my harsh tone, but unfortunately and as much as I’d like to be wrong I believe you are the one who owes as a correction. Hi there Karmos and thanks for the feedback. The game is available for download on several websites, including Abandonia (http://www.abandonia.com/en/games/40/Jones+in+the+Fast+Lane.html). I think they started hosting the game in 2009 or 2010.). The admin write in the forum that: “The Game has become now unprotected and therefore free to download (…)” (http://www.abandonia.com/en/forum?url=showthread.php?t=74). Some guy has also made a free flash version of the game. 🙂 When Abandonia says its ok, it should be. They list titles not available for download and flag them as “protected”. Hope this was a good answer for you. I must say that I looked at many different sites before reviewing the game and all of them had the game available for download. Have a good weekend!